Grown as garden plants for many years, Vireya Rhododendrons are increasingly popular and are an easy care garden plant. Most are small in size and many varieties are suited to cooler climates. They can be grown in the garden, in containers and some are suited to hanging baskets. 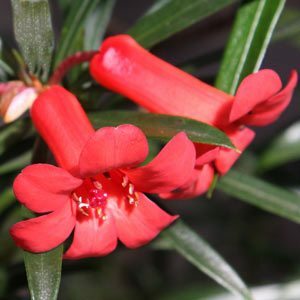 With many new cultivars available for sale from nurseries and specialist growers in Australia, some of the best varieties of these wonderful plants are readily available online. With colorful flowers they make great specimens in a pot on a sheltered patio or verandah as well as in the garden itself. 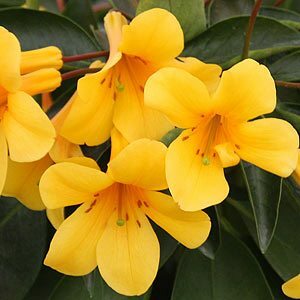 Pictured above is the species Vireya Stenophyllum, however it is the colorful hybrids that are increasingly popular with gardeners. A frost free dappled shade is the best position, with a well drained humus rich soil. Mulch well with an open mulch. The right time to apply liquid fertilizer is in Spring and Autumn. Pruning is generally not required, however you can tip prune after flowering to help maintain a bushy habit. A slow release fertilizer is also beneficial, when applied in early spring. As with most plants a fertilizer high in potassium will help promote flowering. If the foliage if not looking very green, try a foliar spray of iron chelates, also water the plant with the same mixture. Choose a warm position in dappled shade – you are looking for bright dappled shade. A frost free position is essential. When planting it is best to mound up the soil a little by adding well rotted compost and some aged cow manure. Plant the Vireya onto the mound, this will ensure good drainage. Mulch around the plant to maintain moisture and a cool root run. You can tip prune to maintain shape, long leggy stems can be removed after flowering is complete. Always prune to a set of nodes, and always deadhead to promote new flowers and a bushy habit. The best time to prune to shape is during spring through to early summer. Look for a good healthy section of leaf growth on the stem and prune just above this. Removal of spent flower heads and seed pods can be carried out at any time. Vireyas strike easily from cuttings, and these can be taken at any time of the year. What you should look for is new growth that has hardened off a little, but not old woody growth. Cuttings should be around 10cm and ensure the cut is clean. Remove the outer layer of bark for 4cm at the end you are going to plant. Cut back the foliage by at least 1/2. Use a rooting hormone, liquid or powder and you are ready to put the cuttings into the growing media. About 5cm below the soil mix, and the rest above the mix. A fine pine bark mix works well. A greenhouse really helps to maintain the humidity, a little bottom heat is also useful, however a plastic bag over the top can do the same job. Cuttings should be kept moist, a spray with a misting spray now and then works well. In 12 weeks or so the cuttings should have developed a root system. You now have successfully taken your first cuttings. Both tropical and cool climate types are available, the tropical types will tolerate cold winters and hot summers, the cool climate varieties do not grow well in the hot tropical areas. 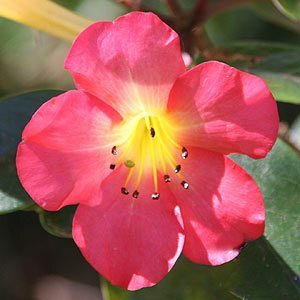 They are one of the most under rated rhododendron plants available for sale. Size wise, these are not as big as their cousins, however the flowers are beautiful. Many have colourful flowers, and the ability grow and flower well in shady positions is a real attraction. Sometimes seen as a tropical plant, they are actually very versatile. In Australia they grow well in Queensland right through to the Dandenong Ranges. Always grow them in a sheltered position away from frosts and in a humus rich free draining soil. In terms or origin, Vireya Rhododendrons are small species of evergreen group of shrubs originally from the tropical forests of New Guinea, Borneo and the Philippines. Plant Vireyas in dappled shade NOT full sun. Do not dig around the base of the plant, Vireyas resent root disturbance. Fruit Trees, Roses, Perennials Rhododendrons and annuals. Includes Avocados for cold climates, persimmon and Olives.